CINCINNATI, CHICAGO and DEERFIELD, Ill., Dec. 4, 2018 /PRNewswire/ -- The Kroger Co. and Walgreens today announced two initiatives, building on the exploratory pilot the companies announced in October, combining America's food and grocery authority with Walgreens global expertise in pharmacy, health and beauty. 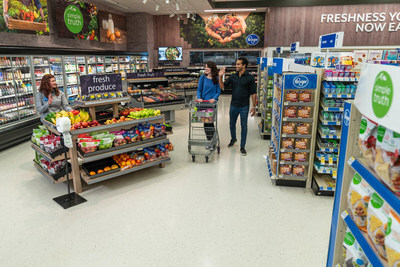 Kroger Express—a curated assortment of 2,300 products, selected using customer data and insights provided by Kroger subsidiary 84.51°—will soon be offered at the 13 Walgreens test stores in Northern Kentucky, near Kroger's Cincinnati headquarters. The Kroger Express selection will include Home Chef meal kits, national products and Kroger's popular Our Brands products, highlighting America's largest natural and organic brand Simple Truth, along with dairy, meat, produce, frozen and meal solutions. on kroger.com for pickup at Walgreens. Kroger Express marks an expansion of the original offering. The new offering enhances the reach of Home Chef's Express products, already available at certain Kroger Family of Stores, including select Mariano's stores in the Chicago area. During the pilot, Walgreens will offer three unique Home Chef Express meal kit options, with recipes rotating bi-weekly. Other recipes are available for delivery through homechef.com, where shoppers can find additional weekly variety. "Making Home Chef Express meals available at Walgreens is another way Home Chef is making meal time easy," said Pat Vihtelic, Home Chef CEO and founder. "The Express recipes, which cook in 15 minutes, are meals anyone can cook and everyone will love."